Rebecca Rego Barry on David Hosack, the doctor who attended Alexander Hamilton to his duel (and death), and creator of one of the first botanical gardens in the United States, home to thousands of species which he used for his pioneering medical research. Detail from a painting of David Hosack’s Elgin Garden, artist unknown, ca. 1810 — Source. IIn 1797, fifteen-year-old Philip Hamilton was burning up with an ordinary, unidentified childhood disease of the time, such as typhus or scarlatina, and appeared to be mere hours from death. The attending family physician, David Hosack, who mostly rejected customary treatments like bloodletting and doses of mercury, took a risk and immersed the boy in a steaming bath with Peruvian bark stripped from the cinchona tree dissolved in it. Peruvian bark was a remedy widely used for malaria, although doctors of the time were unsure why or how it worked (it was the quinine). Hosack then added alcohol to the bathwater and employed smelling salts before swaddling the boy in blankets and putting him back in bed. He repeated this again and again until the fever broke. Philip’s recovery surprised even Hosack, and the boy’s father, Alexander Hamilton, was ever grateful. Portrait of David Hosack, a line engraving by A. B. Durand, 1835, after Thomas Sully — Source (Wellcome Collection: CC BY 4.0). Hosack grew up in British-occupied New York. His father was a Scottish immigrant, and his mother a New Yorker with English and French ancestry. As a child he was sent away to school in New Jersey, and from there enrolled at Kings College (now Columbia University) in Manhattan. In 1788, he apprenticed himself to Dr Richard Bayley, at just the right historical moment to witness the Doctors’ Riot, a public revolt against Bayley and his staff who were accused of exhuming, stealing, and dissecting cadavers. Hosack, a proponent of anatomical dissection, was physically attacked in the scuffle, and at least a few died. From there, Hosack made his way to Philadelphia where he earned a medical degree at the University of Pennsylvania under the famous Benjamin Rush, with whom he would remain lifelong friends, even when they disagreed on curatives. (By many accounts, Rush was “addicted to the virtues of bloodletting”.4) Although Hosack was newly married with an infant son, he decided his next step was a two-year solo trip to Edinburgh and London, where he could continue his medical training. Why did he need further training, and why in Britain so soon after the Revolutionary War? As John C. Greene writes in the Journal of American History: “[P]roud though the Americans were to be independent of Europe for medical instruction, they realized that a medical degree from Philadelphia, Boston, or New York was not the equivalent of training at Edinburgh, London, or Paris.”5 If Hosack wanted to compete with the likes of Rush, Samuel Bard, or John Warren, the leading figures of American medicine, he had to study abroad, as they had. What he found there startled and inspired him. In Edinburgh, he was “mortified by [his] ignorance of botany with which other guests were conversant.”6 He contemplated the fact that though many of the known medicines were derived from roots, leaves, and petals — e.g., infusions from the leaves of menyanthes to soothe herpes sores, or a cough syrup made from arborvitae tree resin — his medical training thus far had not prepared him in the area we might now call botanical pharmacology. In medicine, as in science as a whole, America was still in the process of catching up with its European counterparts, still relying on them “for inspiration and ideas, for models of scientific achievement . . . for books and instruments, and for museums and herbaria.”7 Hosack pondered the contribution America could make in terms of undiscovered species and yet-to-be-discovered medications. Sundew (Drosera sp. ), ca. 1774, a coloured etching by Italian artist Maddalena Bouchard. 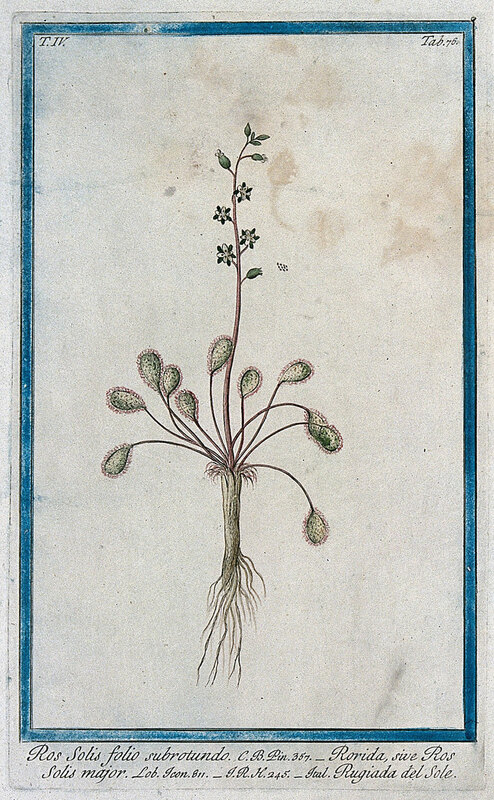 Sundews were used as medicinal herbs as early as the 12th century, and has been used commonly in cough preparations in Germany and elsewhere in Europe – Source (Wellcome Collection: CC BY 4.0). But Hosack’s proverbial walk in the park finally came to an end, and he returned to New York — on a ship plagued by typhus — in 1794 to set up his practice. His wife awaited him, but their son had died during his absence. 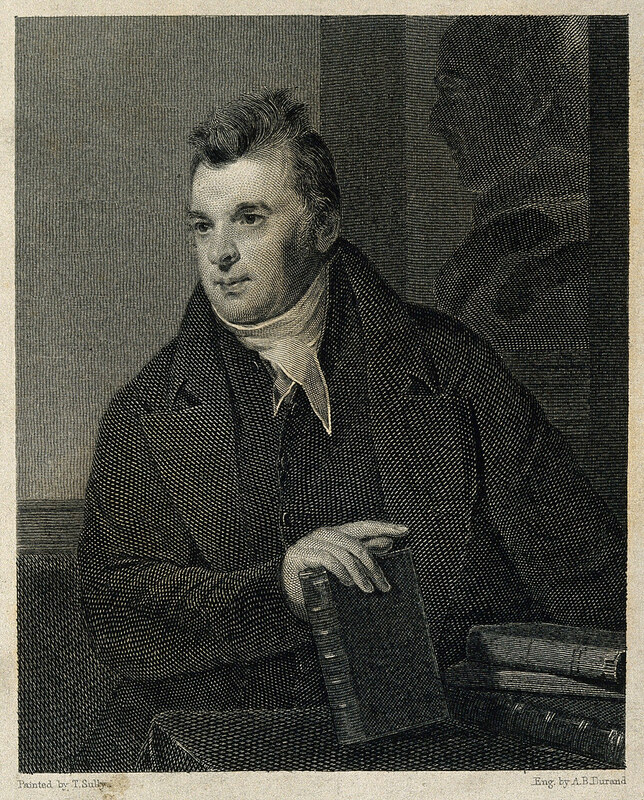 Nevertheless, as a newly minted fellow of the Linnean Society, he immediately began advocating for botanical education. As Johnson writes, he realized “what the nation needed . . . was a new kind of garden — a botany classroom, chemical laboratory, apothecary shop, plant nursery, horticulture school, and lovely landscape all rolled into one.”9 His first salvo was a request for citizen scientists to compile New York state’s first hortus siccus, or dry garden (herbarium), and begin the process of cataloguing native plants for research and experimentation. This idea didn’t get far, and Hosack was understandably too busy to follow up. Within a year, he became professor of botany at Columbia, performed the first hydrocele operation in the United States, and ministered to the sick and dying during the 1795 yellow fever outbreak in New York City. 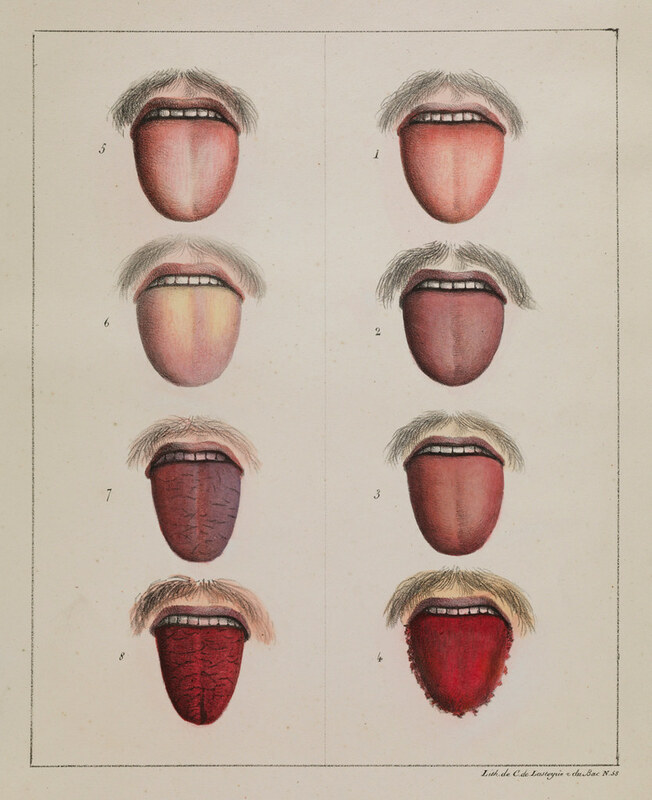 Plate showing the different stages of a diseased tongue with yellow fever, 1820 — Source (Wellcome Collection: CC BY 4.0). Hosack’s pregnant wife survived the scourge only to die in childbirth in early 1796 (prompting him to found the city’s Lying-In Hospital for expectant mothers). In yet another busy year, Hosack was nominated to teach materia medica (early pharmacology), as well as botany, at Columbia. He was also invited to join the practice of the renowned Dr Samuel Bard, who, it seems, also preferred less invasive medicine; when Hosack and Bard both contracted yellow fever in 1798, they healed themselves with infusions of boneset (Eupatorium perfoliatum), followed by teas made from catmint, sage, and snakeroot. 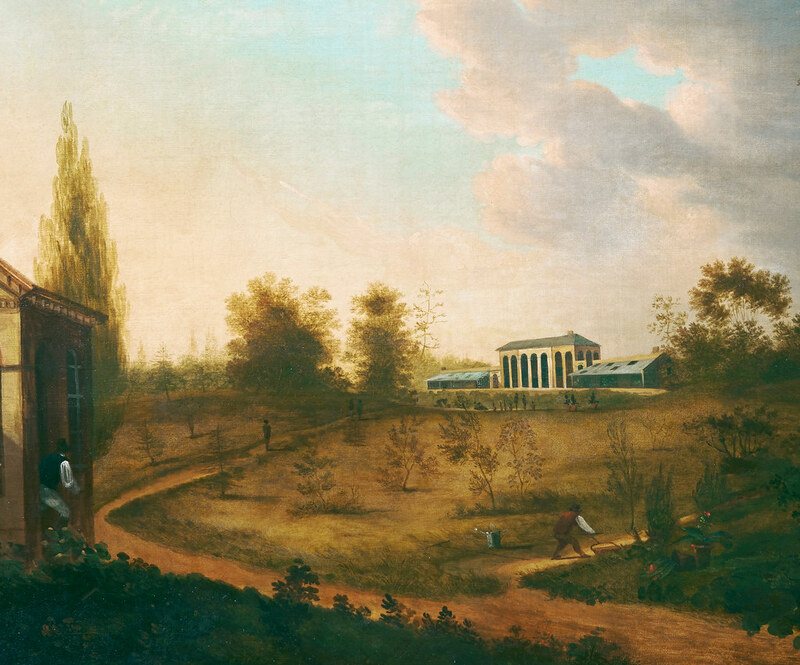 Whether it was the deaths of his own children — a third child died of scarlet fever in 1801 — or his success at saving the lives of others, or the encouragement of Bard, at the turn of the new century, Hosack refused to waste more time without a garden that could produce the botanicals he believed the nation needed. He sought help from Columbia, to no avail, and then lobbied state officials, saying, “We spend large sums upon appropriations for teaching chemistry and medical philosophy — shall we be insensitive to the means of preserving health and curing diseases?”11 Finally, in 1801, he took matters into his own hands. Engraving of Elgin Botanic Garden, featured as the frontispiece to Hosack’s Hortus Elginensis (1811) — Source. 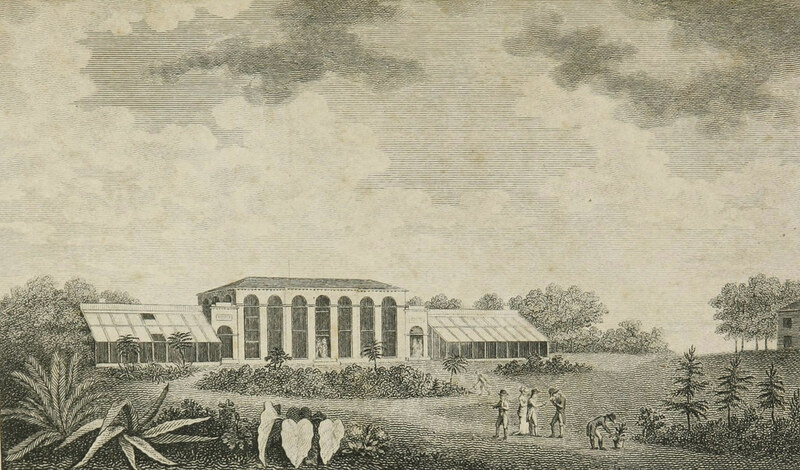 Engraving of Elgin Botanic Garden, featured as the frontispiece to Hosack’s Description of Elgin Garden (1802) — Source. Indeed, by 1806 when Hosack issued his first Catalogue of Plants Contained in the Botanic Garden at Elgin, he had amassed 1,400 exotic species and 250 natives, and he used those collections “to conduct and supervise some of the earliest systematic research in the United States on the chemical properties of medicinal plants”, according to Johnson.14 He was experimenting with known remedies, e.g., mashed fig poultices to relieve infected flesh and sweet bay laurel tree oil to stimulate circulation, and researching the possibility for new ones with plants that grew in abundance nearby, like unicorn root and skullcap for bowel trouble and elderberries to make cough syrup. One of the garden’s least publicized advantages was the creation of a local supply of plants for medical use, which would become important after the passage of the Embargo Act that lead to the War of 1812. Page from David Hosack’s Hortus Elginensis (1811) — Source. 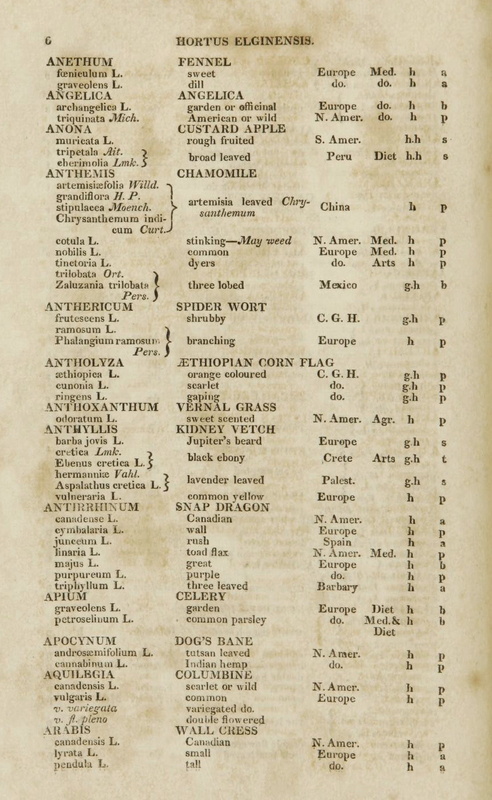 Hosack’s 1811 catalogue, titled Hortus Elginensis, included 2,000 species, and it records the garden at its high point. After many negotiations, the New York state legislature had finally voted to buy Elgin in 1810, handing its management over to the College of Physicians & Surgeons, a medical school that Hosack had been affiliated with, off and on. (Elgin was later regifted to Columbia.) At first, the handover was a relief to Hosack, who had been shouldering the financial burden for a decade, but within a few years, it became clear that the lack of institutional caretaking, coupled with the need for major geographic re-mapping as the city expanded, would be the death of Elgin. The seeds that Thomas Jefferson contributed in 1816 were too little, too late. Today’s pharmacology and pharmaceuticals may be a world away from sneezewort yarrow powders and horehound syrups, but Hosack’s advice to get back to nature still resonates. Rebecca Rego Barry writes about history, literature, and culture for several publications and is the author of Rare Books Uncovered: True Stories of Fantastic Finds in Unlikely Places (Voyageur Press, 2015). Description of Elgin Garden, the property of David Hosack, M.D (1802), by David Hosack. Elgin botanic garden, its later history and relation to Columbia College, the New Hampshire grants and the treaty with Vermont in 1790 (1908) by Addison Brown. Hortus Elginensis, or A catalogue of plants, indigenous and exotic, cultivated in the Elgin Botanic Garden, in the vicinity of the city of New-York (1811), by David Hosack. 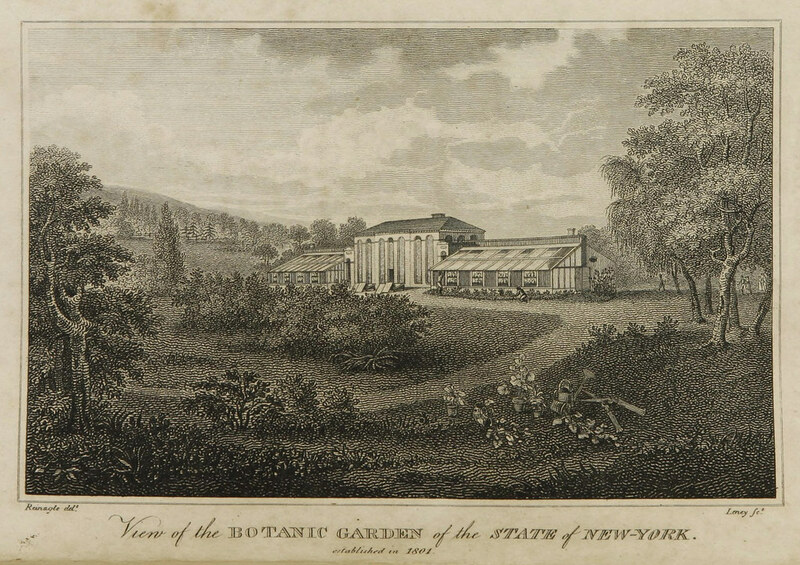 A statement of facts relative to the establishment and progress of the Elgin Botanic Garden, and the subsequent disposal of the same to the State of New-York0 (1811) by David Hosack.